As much as I would like the seasons to transition smoothly, from snow to sun with nothing in between, Spring is typically full of rainy days and gloomy skies. It was a lot easier to navigate around the weather detours when I was living at home with a car, but now that I live in a new city without a proper form of transportation, I feel pretty stuck on days when the weather is not ideal. As much as I enjoy a nice sunny day, sometimes you just have to learn how to dance in the rain. When the weather is not ideal, I typically stay inside. On these days, my suite mate and I will movie marathon it. We raid Netflix's selection or pick and choose from our own little collections. This takes up a lot of time and keeps you entertained without even having to leave the comfort of your home. And you don't have to put pants on. It's a win-win situation all around. I like to walk everywhere I go in the city, even when it's chilly out. But, walking in the rain is extremely uncomfortable and I try to avoid it at all costs. In the off chance that I do want to go outside during day on a rainy afternoon, I take advantage of public transportation. I'll scurry on over to the bus terminal with my umbrella and take it down to the local mall. The stores kind of stink, but it gives me some place to wander for a couple of hours. I'll usually grab a bite to eat and will sort through the vinyls at FYE. If you love some place where the mall has good stores, shopping is always a viable option for those days where it's just not nice enough to explore outside. Reading on rainy days is also a good use of time. When I'm not writing or watching movies/television, I'm reading something. I'll read books, magazines, blog posts, whatever I am feeling on that particular day. It's the perfect way to utilize your time when you don't want to get soaked outside. For me, rainy days are always spent inside one way or another. If you are fortunate enough to have a car, take advantage of it. If you are a little less fortunate on days that are not suited for walking around outside, get creative! There are tons of things that you can do inside. It could be as simple as having a two hour long conversation with a friend about the silliest things. 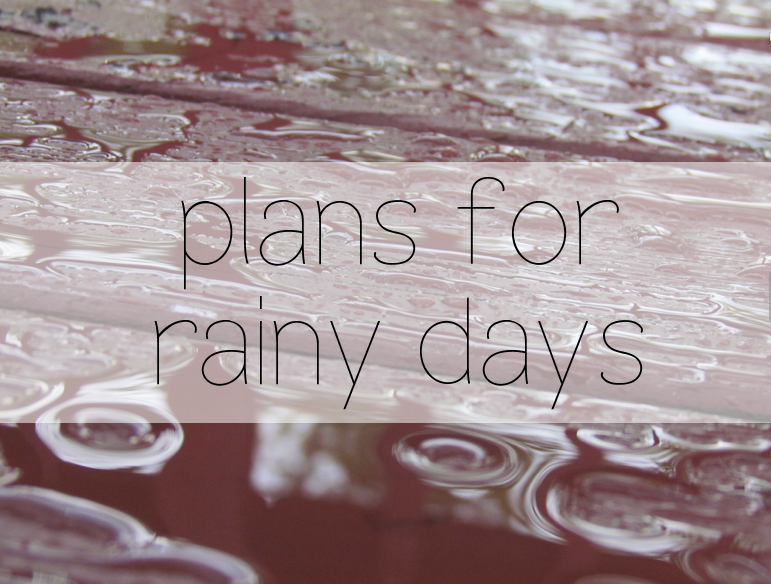 What's your favorite thing to do when it's raining? I will admit that I still like stomping around in puddles occasionally.